Who inspires me: Anyone with a passion. I just love anyone who is passionate about anything. Passion is infectious. Best advice: Get out of your comfort zone as fast as you can. We are all dying here. Don’t waste your life saying you’re GONNA do something JUST DO IT! 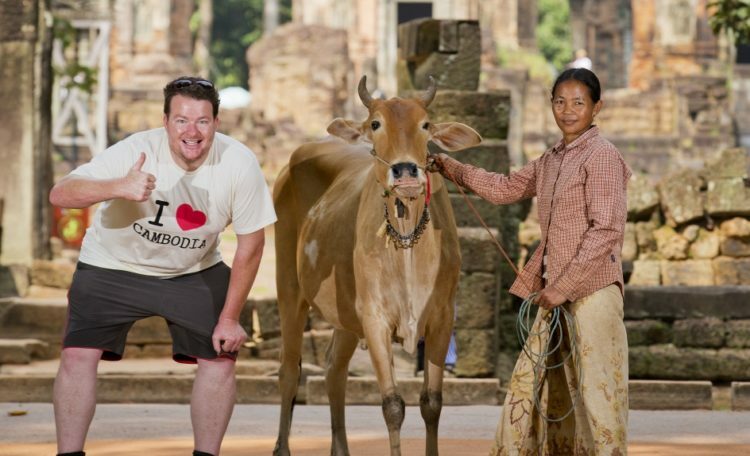 On his first trip to Cambodia, South Australian man Andrew Costello found himself withdrawing money from an ATM to get the hefty $US650 he’d need to buy a single cow. Cash in hand, he began approaching random people with cows and asking to buy a bovine. “But, with the language barrier, they had no idea what I was talking about,” Andrew laughs. Undeterred, three months later Andrew again tried to buy a cow. Again his quest was met by blank looks and puzzled faces. On his third attempt he hired an interpreter to help negotiate the purchase. Success. Andrew, better known as Cosi, had bought himself a cow. Next task? Give it away. 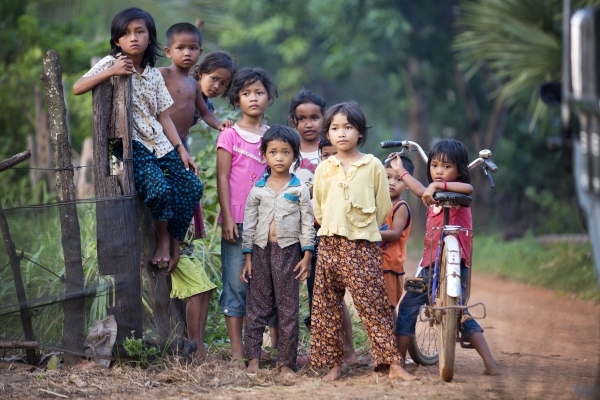 After holidaying in Cambodia while on break from his TV travel show South Aussie with Cosi, Cosi was struck by the extreme poverty that faced Cambodia’s largely rural population. As someone with a keen interest in agriculture, and a degree on the subject, Cosi was interested to learn that cows are the ticket to prosperity for many rural Cambodians. 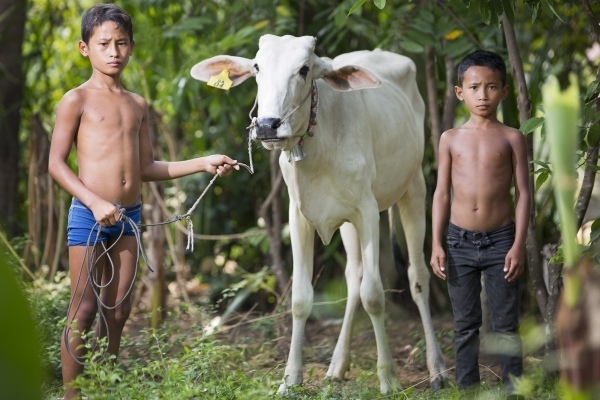 Yet most Cambodians can only dream of cow ownership. At around $US650 per cow, buying one was akin to buying a new house. Cosi imagined the difference a single cow could make to a Cambodian family – one breeding female could produce calves that a family could sell each year to transform their lives in the long term. Intrigued, Cosi determined to see what would happen if he gifted a single cow. 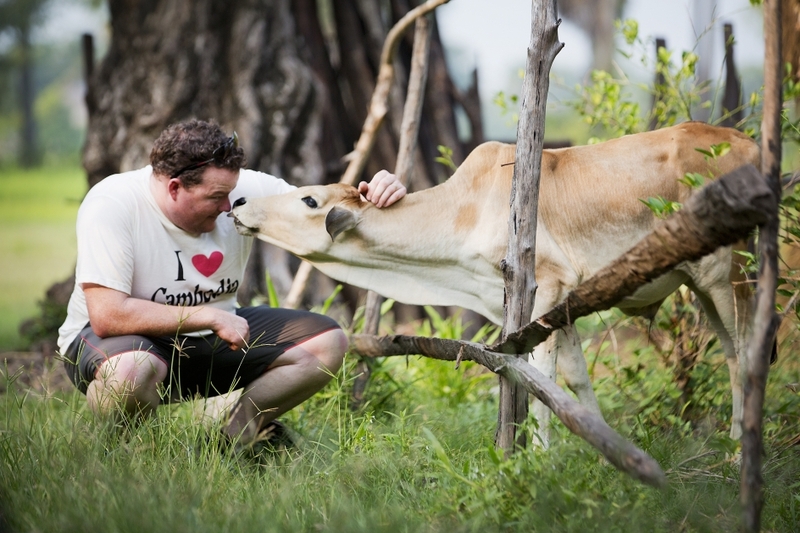 That unlikely experiment has blossomed into a fully functioning charity, Cows for Cambodia, that, 3.5 years later, has gifted 400 cows, is overhauling Cambodian agriculture practices, has built houses and schools, fed thousands and is on the road to becoming financially self-sustaining. Of course Cosi had no inkling of all that when he bought that first cow. At the time, he’d planned to simply give away a cow and be done with it. After buying the cow, whom he named Adelaide, Cosi cruised the streets of rural Cambodia to find someone to gift his purchase. He eventually spied woman sitting in the dirt on the side of the road selling bottles of water. Cosi got to chatting with the woman, who invited him to her home – a single-roomed, palm-leaf-roofed shack where she lived with her children. “She had virtually nothing in the way of possessions – most Cambodians just have the clothes that they are wearing and not much else. But she had a really neat and tidy yard, which was well swept with little herbs growing,” Cosi says. “You could tell she was having a red hot go at life and she had this smile that would knock you sideways.” Impressed at her determination to succeed with so little, Cosi had found himself the perfect cow recipient. 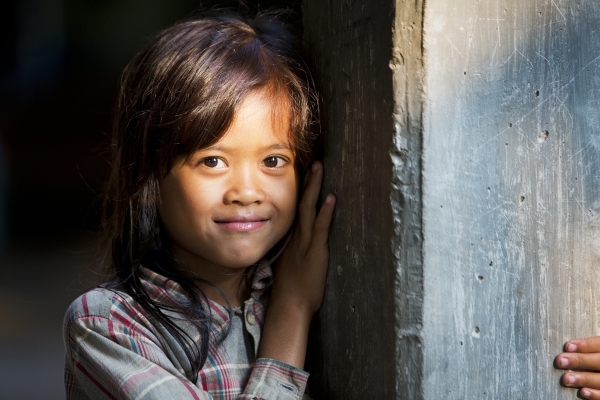 Still, when Cosi returned to Cambodian another three months later he wasn’t sure what to expect. “I didn’t even know if the cow was going to be there,” he says. “I didn’t know if she would have sold it or eaten it. But it was there, they’d built a shelter for it and the cow had put on weight.” Delighted with the result, Cosi decided to buy four more cows. Last year Cosi realised his dream of donating 100 cows, and quickly surpassed it to have now donated 400 cows. In the process Cosi came to realise the quality of Cambodian cows, for their price, was no match for the genetics of Australian stock. So Cosi embarked on a gruelling period of negotiation to result in a breeding agreement between the Cambodian and Australian governments. Cosi is now breeding Australian cows on a station outside Katherine in Australia’s Northern Territory, which will head to Cambodia in the next six months for the Cows for Cambodia program. While checking on the health of the cows he’d donated (Cosi was determined Cows for Cambodia cows “be the happiest in the country”) Cosi realised how much condition the cows lost during the dry season. So he set to researching alternative feed types. He discovered a fast-growing and highly nutritious African grass which, after months of research and negotiations, he received permission to grow on an irrigated plot in Cambodia. Within a month the grass was head high, and ready for baling, chopping and drying. Cosi went on to buy and irrigate 16 hectares of land to grow the grass. And Cambodian farmers are now poised to grow the game-changing feed themselves. So much did Cosi come to admire the Cambodian people that he couldn’t help but do more. He began donating huge amounts of rice to people struggling to buy food – he and a growing army of volunteers handed out 20,000 kilograms of rice on his last two-week trip alone. The charity also started supporting children’s education after Cosi passed a school a while back – a three-sided shed with about 16 students and two volunteer teachers providing free education. Cosi was impressed with the community’s initiative to have raised the $300 needed to build the school and, again, he couldn’t resist helping. He and Cows for Cambodia volunteers and supporters funded a massive refurbishment that now sees 250 local kids receive a free education. And there are plans to double the size of school again in November, to increase student numbers to 500. Cosi plans to introduce a similar initiative in the Philippines, or India, as well as a similar charity based on goats in Botswana, Africa. He also plans to turn the 16 hectares he has purchased in Cambodia into a state-of-the-art cattle breeding facility that, once established, will be financially self-sustaining. The facility will serve as a base to educate Cambodian farmers about handling and breeding their own stock. Cosi dreams of being able to hand over the whole operation to the Cambodians to continue as a profitable enterprise which educates, and supports Cambodians farmers and, in the process, transforms their poverty-stricken lives.